If you don’t type anything after the prompt and you press Enter then nothing happens and you get a new prompt under the old prompt. The white rectangle after the prompt is just a cursor that allows you to edit what you have typed into the shell. Your cursor might look like a rectangle, a line, or an underscore, but all cursors behave the same way. After typing something into the command line you can move the cursor back and forth with the left and right arrow keys, just like you would when typing an email. Now that we have pressed Enter several times our shell looks messy with all of those old prompts! Do not worry, you are about to learn your first shell command which will clear all of those old prompts from your shell. Type clear at the prompt and then hit Enter. Voila! Your shell now only has the current prompt, just like when you first opened the terminal. We will be using the above syntax for the rest of the book, where on one line there will be a command that I have entered into the command line, and then below that command the console output of the command will appear (if there is any console output). You can use echo to print any phrase surrounded by single quotes ('') to the console. If you want to see the last command press the Up arrow key. You can press Up and Down in order to scroll through the history of commands that you’ve entered. If you want to re-execute a past command, you can scroll to that command then press Enter. Try getting back to the echo 'Hello World!' command and execute it again. You type command line commands after the prompt. clear will clean up your terminal. echo prints text to your terminal. You can scroll through your command history with the Up and Down arrow keys. Print your name to the terminal. Clear your terminal after completing #1. You have learned two command line commands (clear and echo) which is pretty good! Before you learn more commands we need to discuss how files and folders are organized on your computer. Computers are organized in a hierarchy of folders, where a folder can contain many folders and files. People who use Unix often refer to folders as directories and these terms are interchangeable. This directory hierarchy forms a tree, like the diagram below. You can use the command line to navigate these trees on your computer. As you can see in the image below, my Debussy directory is contained in my Music directory. This is the simplest case of how directories are structured. There are a few special directories that you should be aware of on your computer. The directory at the top of this tree is called the root directory. The root directory contains all other directories, and is represented by a slash (/). The home directory is another special directory which contains your personal files, like your photos, documents, and the contents of your desktop. The tilde (~) represents a shorthand for your home directory. Imagine tracing all of the directories from your root directory to the directory you are currently viewing. This sequence of directories is called a path. 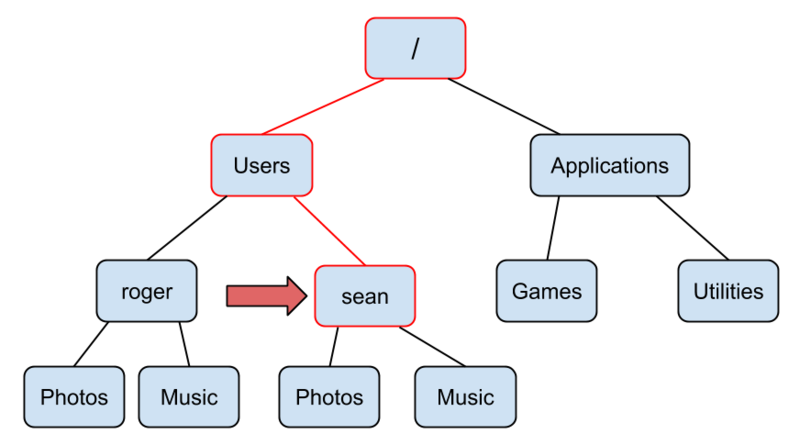 The diagram below illustrates the path from the root directory to a directory called sean. This directory happens to be my home directory. This path can be written as /Users/sean. Since this is my home directory, We can also use ~ as a shorter way to refer to the same path. We will see this demonstrated soon. Open the command line if you closed it. Your shell is always in a directory, and the directory that your shell starts in your home directory. Whatever directory your shell is in is called the working directory. Enter the pwd command into your shell to print the working directory. You can change your working directory using the cd command. If you use the cd command without any arguments then your working directory is changed to your home directory. Enter cd into the command line and then enter pwd. You were in your working directory to start, and by entering cd into the command line you did technically change directory, you just changed it to your home directory (the directory you were in to begin with). To use cd to change your working directory to a directory other than your home directory, you need to provide cd with the path to another directory as an argument. You can specify a path as either a path that is relative to your current directory, or you can specify the absolute path to a directory starting from the root of your computer. Let’s say we simply want to change the working directory to one of the folders that is inside our home directory. First we need to be able to see which folders are in our working directory. You can list the files and folders in a directory using the ls command. Let’s use the ls command in our home directory to list the files and folders contained within it. Notice that .. is also a relative path, since it specifies the directory above your current working directory. Similarly . is the path to your current working directory. Therefore since my current working directory is /Users/sean then cd Music is the same as cd ./Music. It does not matter what directory the shell is in since we are using an absolute path. Therefore we can jump straight to a directory as long as we specify the absolute path. Notice above that we used ~ as shortcut for /Users/sean/. Since I added a “D” to the path, only folders with names that start with a “D” are listed. If I type cd ~/De into the console and then press Tab then the command will autocomplete to cd ~/Desktop/. If I press Tab again, the console will list all of the files and folders on my desktop. Make sure to pause and try this yourself in your own terminal! You will not have the same files or folders that I do, but you should try using cd and tab completion with directories and files that start with the same letters. You can identify a specific file or folder by its path. The root directory (/) contains all of the folders and files on your computer. Your home directory (~) is the directory where your terminal always starts. Your terminal is always inside of a working directory. When you open your terminal your working directory will be set to the home directory. Use the cd command to change your working directory. The pwd command will print the working directory. The ls command will list files and folders in a directory. Set your working directory to the root directory. Set your working directory to your home directory using three different commands. Find a folder on your computer using your file and folder browser, and then set your working directory to that folder using the terminal. List all of the files and folders in the directory you navigated to in #3. It worked! Notice that the argument Code to the command mkdir is a relative path, however we could have specified an absolute path. In general you should expect Unix tools that take paths as arguments to accept both relative and absolute paths. A new file has been created! We have been using ls to list the files and folders in the current directory, but using ls alone does not differentiate between which of the listed items are folders and which are files. Thankfully you can use the -l option with ls in order to get a long listing of files in a directory. There is a row in the resulting table for each file or folder. If the entry in the first column is a d, then the row in the table corresponds to a directory, otherwise the information in the row corresponds to a file. As you can see in my home directory there are five directories and two files. The string of characters following the d in the case of a directory or following the first - in the case of a file represent the permissions for that file or directory. We will cover permissions in a later section. The columns of this table also show who created the file, the group that the creator of the file belongs to (we will cover groups later when we cover permissions), the size of the file, the time and date when the file was last modified, and then finally the name of the file. The wc command displays the number of lines in a file followed by the number of words and then the number of characters. Since this file looks pretty small (only three lines) let’s try printing it to the console using the cat command. The cat command will combine every text file that is provided as an argument. You can scroll up and down the file line-by-line using the up and down arrow keys, and if you want to scroll faster you can use the spacebar to go to the next page and the b key to go to the previous page. In order to quit less and go back to the prompt press the q key. As you can see the less program is a kind of Unix tool with behavior that we have not seen before because it “takes over” your terminal. There are a few programs like this that we will discuss throughout this book. roads that lay before them. echo "I'm in the terminal." ## I'm in the terminal. ## I'm in the file. ## I have been appended. Unfortunately we have unintentionally overwritten what was already contained in echo-out.txt. There is no undo button in Unix so we will have to live with this mistake. This is the first of several lessons demonstrating the damage that you should try to avoid inflicting with Unix. Make sure to take extra care when executing commands that can modify or delete a file, a typo in the command can be potentially devastating. Thankfully there are a few strategies for protecting yourself from mistakes, including managing permissions for files, and tracking versions of your files with Git, which we will discuss thoroughly in a later chapter. Once you have started nano you can start editing the text file. The top line of the nano editor shows the file you are currently working on, and the bottom two lines show a few commands that you can use in nano. The caret character (^) represents the Control key on your keyboard, so you can for example type Control + O in order to save the changes you have made to the text file, or Control + X in order to exit nano and go back to the prompt. nano is a good editor for beginners because it works similarly to word processors you have used before. You can use the arrow keys in order to move your cursor around the file, and the rest of the keys on your keyboard work as expected. Let’s add an item to the to-do list and then we will save and exit nano by typing Control + O followed by Control + X. - write final section of "command line basics"
## - write final section of "command line basics"
You can also create new text files with nano. Instead of using an existing path to a file as the argument to nano, use a path to a file that does not yet exist and then save your changes to that file. Use mkdir to create new directories. The touch command creates empty files. You can use > to redirect the output of a command into a file. >> will append command output to the end of a file. Print a text file to the command line using cat. Inspect properties of a text file with wc. Peak at the beginning and end of a text file with head and tail. Scroll through a large text file with less. nano is simple text editor. Create a new directory called workbench in your home directory. Without changing directories create a file called readme.txt inside of workbench. Append the numbers 1, 2, and 3 to readme.txt so that each number appears on it’s own line. Print readme.txt to the command line. Use output redirection to create a new file in the workbench directory called list.txt which lists the files and folders in your home directory. Find out how many characters are in list.txt without opening the file or printing it to the command line. Finally, let’s discuss how to delete files and folders with the command line. A word of extreme caution: in general I do not recommend deleting files or folders on the command line because as we have discussed before there is no undo button on the command line. If you delete a file that is critical to your computer functioning you may cause irreparable damage. I highly recommend moving files or folders to a designated trash folder and then deleting them the way you would normally delete files and folders outside of the command line (The path to the Trash Bin is ~/.Trash on Mac and ~/.local/share/Trash on Ubuntu). If you decide to delete a file or folder on your computer make absolutely sure that the command you have typed is correct before you press Enter. If you do delete a file or folder by accident stop using your computer immediately and consult with a computer professional or your IT department so they can try to recover the file. Now that the awesome destructive power of rm is on your side, you have learned the basics of the command line! See you in the next chapter for a discussion of more advanced command line topics. mv can be used for moving or renaming files or folders. cp can copy files or folders. You should try to avoid using rm which permanently removes files or folders. Create a file called message.txt in your home directory and move it into another directory. Copy the message.txt you just moved into your home directory. Delete both copies of message.txt. Try to do this without using rm.